Dixon started making ZTR mowers in 1974. Back in those days, a mechanical transmission was used instead of the hydraulic units which have become an industry standard today. Because Dixon has been around for a long time, expertise has been developed which is seen in the entire product line. From the first modes “ZRT-1” ( which resembled a cross between a golf cart and a toddler’s pedal toy) to the new “Ram Ultra 72” (which lives up to it’s name in every regard), Dixon mowers have been there for the long haul. All the Dixon ZTR Lawn Mowers feature the ‘3 in 1’ option,allowing for side discharge, mulch, or rear bagging. The deck cutting height is adjusted manually using a l foot control. The frames on all the Dixon ZTR models is fully welded steel ( no bolts and nuts to come loose, compromising the frame strength). Dixon ZTR Lawn Mowers are available in 3 model series - the Speed ZTR, the Ram, and the Ram Ultra. As the name implies, the Ram Ultra is the top line homeowner series, with the largest engines and most features, including heavy duty pumps and hydraulic wheel motors. There are seven Speed ZTR models available, five Ram models, and three models in the Ram Ultra series. The Speed ZTR series offers a choice between a single cylinder Briggs and Stratton 16.5 or 19 HP single cylinder engine, a Briggs and Stratton twin cylinder 22 HP engine, a Kawasaki 17 HP single cylinder engine, or a Kohler twin cylinder 24HP engine. All the engines feature overhead valves ( OHV). Because The Speed ZTR line is designed with price in mind, one model ( Speed ZTR 30) has a manual PTO to engage the cutting blades. The cutting deck is stamped steel on this model, with a single cutting blade. This model has the 16.5 HP single cylinder Briggs and Stratton engine under the hood. All other Dixon mowers feature an electric PTO, and at least 2 cutting blades under the deck. All models in this series have dual Hydro-Gear transmissions powering the wheels. Model Speed ZTR 36 comes with a 36” twin blade cutting deck, and is powered by a 19 HP single cylinder engine. Cast iron spindles come standard. Model Speed ZTR 44 has a 44” cutting deck, with either a 22 HP Briggs and Stratton twin cylinder engine, or a 17 HP Kawasaki engine. The Speed ZTR 46 powers a deck that leaves a 46” swath. A Briggs and Stratton 19 HP single cylinder engine comes standard. The drive spindles are cast aluminum, and are mounted on a stamped steel deck, helping to keep the price down. Next is the Speed ZTR 48, which has a Kohler twin cylinder 24 HP engine. The cutting deck is fabricated steel, with aluminum drive spindles. Largest of the Speed ZTR’s is Speed ZTR 54, which features a 22 HP Briggs and Stratton engine. The cutting deck is stamped steel, with aluminum spindles. Count on spending between $.00 to $.00 for the mowers in the Speed ZTR series. The next series of Dixon ZTR Lawn Mowers include the models in the Ram Series. Here the choice is between either a 24 HP twin cylinder overhead valve ( OHV) Kawasaki, or 26 HP OHV Briggs and Stratton engine. A Kawasaki 21 HP engine is offered on one model (Ram 50 KZ). Note the horsepower ratings are increased in comparison to the Speed ZTR models. The transmissions are either Dual Hydro-Gear or the more robust Kanzaki pump-Parker motor combination. All the Ram series mowers have an electric PTO to engage the cutting blades, which is switch operated. The cutting deck is made of fabricated steel, which is much more durable than a stamped steel deck. Adjusting the deck height is accomplished by a foot pedal, instead of using a hand lever. Model Ram 48 comes with a 48” triple blade cutting deck with aluminum spindles, and is powered by the 24 horsepower twin cylinder Kohler engine. The transmission is composed of dual Hydro-Gear units. Model Ram 50 KZ has a 3 blade 50” cutting deck, with the same 24 HP engine Kohler engine. The Kawasaki engine is also an option. The spindles are upgraded to cast iron, and the drive wheels feature the better Kanzaki pumps and Parker motors on the wheels. Model Ram 50 ZT has a 3 blade 50” cutting deck, and features the 26HP Briggs and Stratton twin cylinder engine. The transmission is dual Hydro-Gear units. Spindles are cast iron. Top of the Ram line is model Ram 61 K that features the powerful twin cylinder 26 HP Briggs and Stratton engine. The cutting deck is an impressive 60 inches in width, and is fabricated steel construction. Spindles are aluminum. Top of the line Kanzaki pumps and Parker hydraulic motors are a winning combination for the drive system. 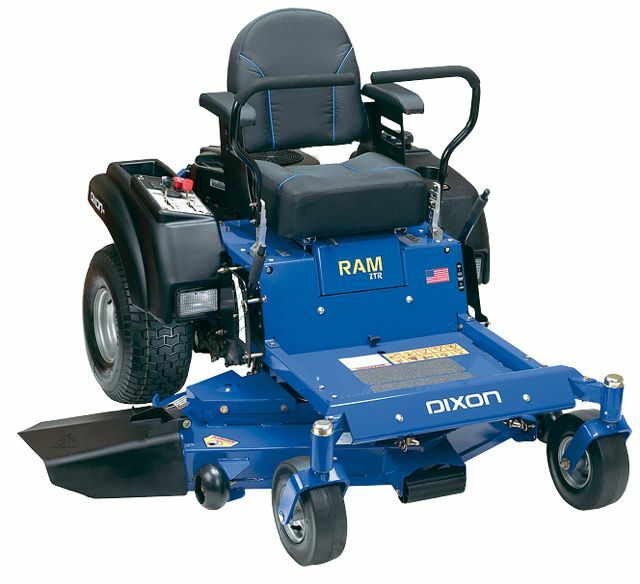 Count on spending between $.00 to $.00 for Dixon ZTR Lawn Mowers in the Ram series. Top of the line in the homeowner models by Dixon ZTR Lawn Mowers are the Ram Ultra Series. The name hints at something special, and these mowers deliver. Choose between either a 25 or 27 HP twin cylinder overhead valve ( OHV) Kohler engine. The transmissions are top of the line Kanzaki DUP10, with wheel motors. All the Ultra Ram series mowers have an electric PTO to engage the cutting blades, which is switch operated. The cutting deck is made of fabricated steel, which is much more durable than a stamped steel deck. Adjusting the deck height is accomplished by a foot pedal, instead of using a hand lever, which is seen on some brands of ZTR mowers. Dixon ZTR lawn mower model Ultra Ram 52 comes with a 50” triple blade cutting deck with aluminum spindles. The transmission is composed of dual Kanzaki pumps with wheel motors. Model Ram Ultra 61 has a 3 blade 61” cutting deck, with the same 25 HP engine Kohler engine. The spindles are upgraded to cast aluminum, and the drive wheels feature the sturdy Kanzaki pumps and wheel motors. Model Ram Ultra 72 is at the top of the homeowner ZTR mountain. Featuring a massive 3 blade 72” fabricated steel cutting deck powered by the 27 HP Kohler twin cylinder engine, this machine is a work of art. The blade spindles have been upgraded to cast iron, and have greasable bearings. Most customers that purchase a Dixon ZTR lawn mower are pleased with their purchase. This is a solid Midwestern company that has been building a good product for decades.